Kitchen restaurant hotel banquet html5 template, build on Bootstrap 4 framework which is support mobile and handheld device, restaurant website template designed for hotels, resorts, banquets hall, events, coffee shop, food trucks, and accommodation service providers also web design & web development companies. The kitchen is a beautiful & clean minimal white space & balanced typography design, which gives your customer professional experience of high-quality service. The template built with Bootstrap 4 which intends is 100% responsive website template compatible with desktop, tablet & mobile. This template most designed with the feature for banquet hall and hotel room booking features. Owner of restaurants, and hotels who offers a banquet hall for events like Wedding, wedding reception, bridal shower, birthday party, anniversary, pool party, reunion, Thanksgiving, corporate meeting, roundtable, cocktail party, housewarming, and conventions. If you are restaurant website design company or web agency and looking for a great design for your client and local restaurant customer, then kitchen a restaurant hotel banquet html5 template is the best choice for you. Nowadays people are always looking for an online restaurant, hotel booking sites. The kitchen has to feature like online hotel reservation form template. 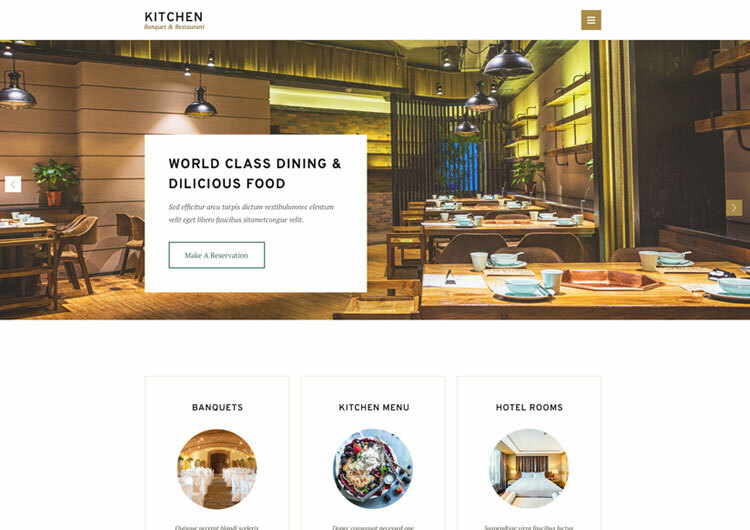 The Kitchen restaurant hotel banquet html5 template is the best hotel & banquet booking websites template for creating your amazing eatery & restaurant website. A clean and minimal white looking restaurant homepage design is professional design for your restaurant business. It has a header with logo and collapse navigation menu design expand from the top. Owl carousel slider, lets you create beautiful responsive carousel slider with white captions with bold typography. Feature section for a banquet hall, hotel rooms, and kitchen menu. Banquet Hall Page Design for showcase your banquet hall information like banquet packages, pricing, square feet, amenities, the gallery for your banquet and make a reservation button to reservation form page template. Almost all hotel offers exclusive deals and incredible offer in their room packages. Our design template will present the same design with room name ( silver, golden, platinum, deluxe, ) & price, and amenities, thumbnail gallery. Restaurant menu template professionally designs that you can use for your food menu. Menu design has an element of the title menu, price, ingredient. Reservation form template for online booking service to your restaurant, banquet, and hotel. It is great for hoteliers. Foodservice & restaurant client testimonials work like a magic. To show your customer feedback on your website with the star rating. Its simple magnific popup gallery for your restaurant interior & exterior design showcase. Google Maps integration for the restaurant location. Accordion, Tabs, Alerts, Call to action. Elements to build your website.